HINTERGRUND: Die Hornhauttätowierung stellt eine der ältesten Möglichkeiten zur kosmetischen Rekonstruktion des Auges dar. 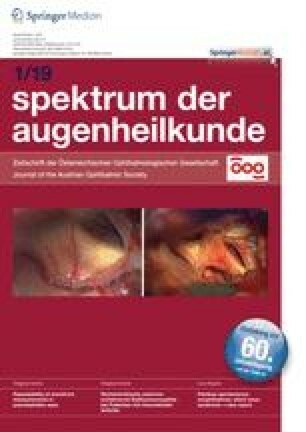 In diesem Fall beschreiben wir die Kombination aus Hornhauttätowierung mit vorderer lamellärer Keratoplastik in einem blinden Auge mit Leucoma corneae zur einfachen, zeitsparenden und permanenten Färbung der Hornhaut. MATERIAL: Ein 68-jähriger Patient zeigte einseitig eine weißliche Hornhaut mit irregulärer Oberfläche. Das Auge war nach einer perforierenden Verletzung seit 30 Jahren blind. Eine Iris-Print-Kontaktlinse wurde nicht vertragen. Der kosmetische Aspekt störte den Patienten sehr und eine operative Rekonstruktion wurde geplant. Die Hornhaut des Patienten wurde mit 7,5 mm Durchmesser markiert. Anschließend wurde das vordere stromale Gewebe mit einer Tiefe von 350 µm entfernt. Am Spendergewebe wurde eine 400µm dicke Hornhautlamelle präpariert und nach Einlegen in schwarzer Tinte (Art R 591017, Rotring, Deutschland) an die Empfängerhornhaut mittels Einzelknopfnähten fixiert. ERGEBNISSE: Das Hornhautepithel war nach 1 Woche geschlossen und das kosmetische Ergebnis zufriedenstellend. Auch zwei Jahre postoperativ war die Färbung vorhanden und es wurden keine postoperativen Komplikationen beobachtet. SCHLUSSFOLGERUNGEN: Die Hornhauttätowierung in Kombination mit vorderer lamellärer Hornhauttransplantation stellt eine einfache, zeitsparende und permanente Möglichkeit der kosmetischen Rekonstruktion eines blinden Auges mit weißer Hornhaut dar. BACKGROUND: Corneal tattooing is one of the oldest techniques for cosmetic reconstruction of the eye. In this case, we describe the combination of anterior lamellar corneal transplantation in combination with corneal tattooing in a blind eye with leucoma corneae. The technique has the advantage to be easy, time-saving and permanent. MATERIALS: A 68-year-old patient presented with a white cornea and irregular surface in the left eye. The eye was blind since a penetrating injury 30 years ago. A cosmetic contact lens was not tolerated and since the cosmetic aspect bothered the patient, an operation was planed. The central cornea was marked with a 7.5 mm trephine. Afterwards the anterior stromal tissue was removed at a depth of 350 µm. The donor stromal tissue was prepared with a thickness of 400µm and afterwards fixed to the recipient bed with single interrupted sutures after covering the donor tissue with black ink (Art R 591017, Rotring, Deutschland). RESULTS: The corneal epithelium was closed after one week and the cosmetic aspect was satisfactory. Even two years later, the corneal staining was present and no postoperative complications were observed. CONCLUSION: Corneal tattooing in combination with anterior lamellar transplantation is an easy, timesaving and permanent method for cosmetic reconstruction of a blind eye with a white cornea.